I decided to do some ad-hoc analsis of my social network on Twitter this afternoon… and since everything is more fun if you bundle it up into a SQLite database and publish it to the internet I performed the analysis using Datasette. Search my followers (their name, bio and location), return results ordered by follower count. This is a parameterized query—here are the resuts for django. Whe are my most influential followers based on their own follower count? For all of my “verified” followers, who are following the least numbers of people themselves? In which years did my followers first join Twitter? What are the most common locations for my followers? What are the most common time zones for followers with different languages? This is another parameterized query—here are the results for en, es, fr. The thing I find most exciting about this use-case for Datasette is that it allows you to construct entire mini-applications using just a SQL query encoded in a URL. Type queries into the textarea, iterate on them until they do something useful, add some :named parameters (which generate form fields) and bookmark the resulting URL. It’s an incredibly powerful way to build custom interfaces for exploring data. The rest of this post will describe how I pulled the data from Twitter and turned it into a SQLite database for publication with Datasette. To work with the Twitter API, we first need credentials. 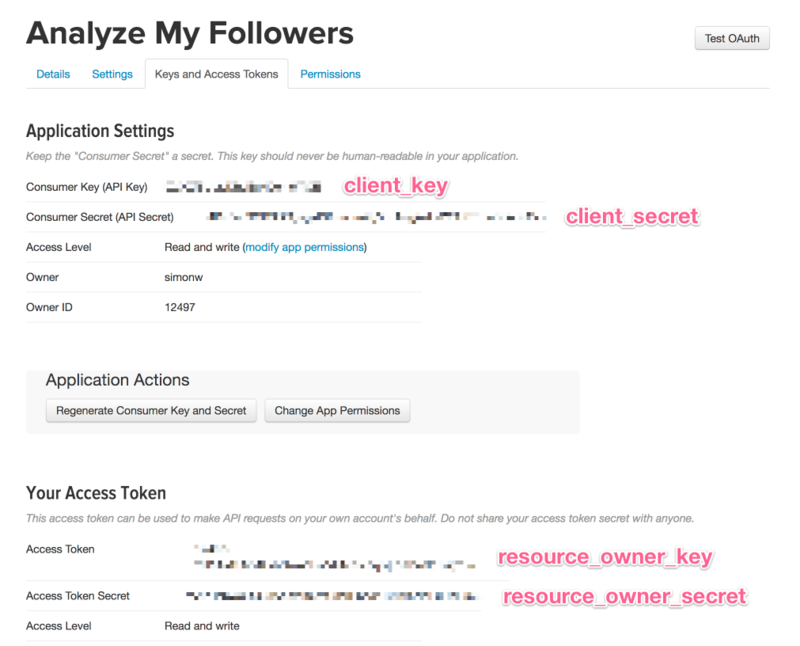 Twitter still mostly uses the OAuth 1 model of authentication which is infuriatingly complicated, requiring you to sign parameters using two pairs of keys and secrets. OAuth 2 mostly uses a single access token sent over TLS to avoid the signing pain, but Twitter’s API dates back to the times when API client libraries with robust TLS were not a safe assumption. The Twitter API has an endpoint for retrieving everyone who follows an account as a paginated JSON list: followers/list. At some point in the past few years Twitter got really stingy with their rate limits—most endpoints, including followers/list only allow 15 requests every 15 minutes! You can request up to 200 followers at a time, but with 15,000 followers that meant the full fetch would take 75 minutes. So I set the following running in a Jupyter notebook and went for a walk with the dog. 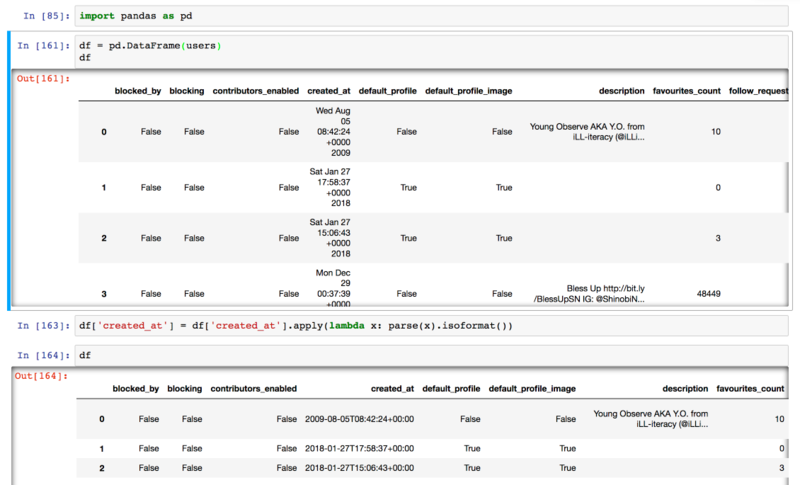 I wrote some notes on How to turn a list of JSON objects into a Datasette using Pandas a few weeks ago. This works really well, but we need to do a bit of cleanup first: Pandas prefers a list of flat dictionaries, but the Twitter API has given us back some nested structures. I now have a nice flat list of users dictionaries—a subset of which is provided here for illustration. Now I can run datasette /tmp/followers.db to preview what I’ve got so far. This all works fine, but it’s not quite the finished product I demonstrated above. My desired final state has two additional features: common values in the lang, location, time_zone and translator_type columns have been pulled out into lookup tables, and I’ve enabled SQLite full-text search against a subset of the columns. Normally I would use the -c and -f arguments to my csvs-to-sqlite tool to do this (see my write-up here), but that tool only works against CSV files on disk. I want to work with an in-memory Pandas DataFrame. --title="@simonw Twitter followers, 27 Jan 2018"
This is Analyzing my Twitter followers with Datasette by Simon Willison, posted on 28th January 2018.